Your course of acne treatments will begin during your first appointment with your Cosmetic Dermatology Specialist and acne Doctor. We have 9 locations conveniently located in and around the Toronto area. Determining the proper treatment for your case of acne begins with a thorough examination. Our Cosmetic Dermatology Specialist will look at your acne and ask you some questions about the treatments that you have used and certain behaviours that sometimes contribute to the development of acne. By understanding the underlying causes of your acne as best we can, we can create a course of treatments to eliminate the condition both in the short-term and over the long-term. The treatments that you receive will likely include topical creams and laser treatments. These treatments are state of art and will get rid of your acne and scarring. Toronto is able to get results even for those patients who have tried over the counter treatments only to have them fail to work or work just for short periods of time. Your follow-up appointments are an extremely important part of your course of treatment with us because they give our specialists the opportunity to see whether or not you are getting the results that you desire. Based on your examinations during these visits, the Cosmetic Dermatology Specialist may adjust your treatment to maximize your results. The Dermatology Specialists at Toronto may also provide you with additional treatments, such as glycolic peels, to enhance the progress that you are making. These peels do not take long, but they and the post peel creams provided afterwards are highly effective and considerably less expensive than the alternatives. 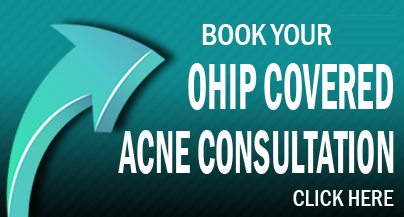 If you are ready for highly effective acne treatments with an acne doctor in the Toronto area, call us today to schedule your initial consultation.